Aira Force car park on the A592 by Ullswater (NY 401200). Pay and display car park. 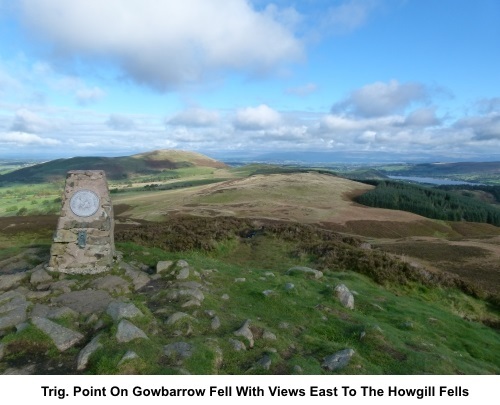 Introduction: This walk on Gowbarrow Fell provides some fabulous views along Ullswater, without a massive amount of climbing. 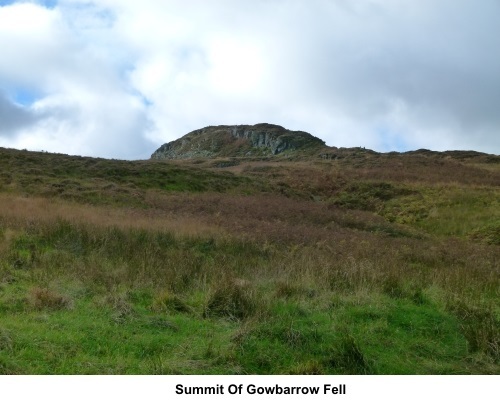 The path broadly follows the contours of the hill above the lakeside and when it turns towards the summit, it does so in a fairly gentle manner. The descent is quite steep (hence the amber traffic light) but nothing to worry about. 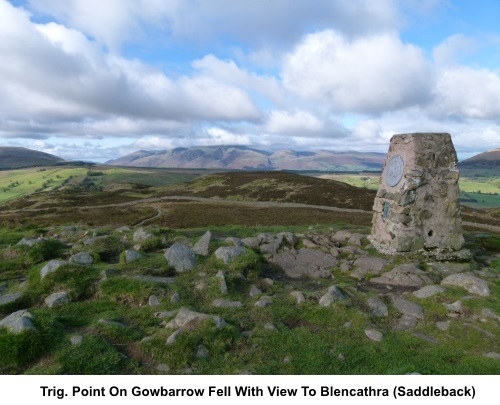 The summit is at 1578 ft (481 metres) and as you approach it, you begin to get views towards the north and in particular, excellent views of Blencathra (Saddleback) with its ridges, including the famous Sharp Edge, clearly picked out on a sunny day. 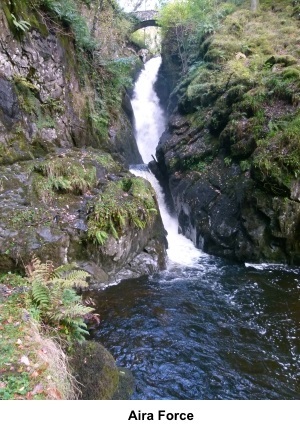 Apart from the views, the crowning glory of Gowbarrow Fell is Aira Force, a fabulously impressive seventy feet waterfall, set in what was a pleasure garden, built in the 1770s, with trails through the woods. 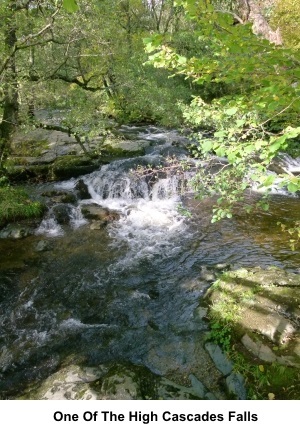 There are other minor waterfalls to see too, on the path through attractive woodland. 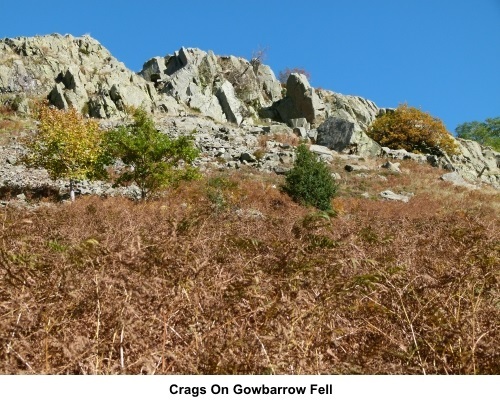 Gowbarrow Fell is situated on the north side of Ullswater, about five miles west of Pooley Bridge. The walk starts from the eyewateringly expensive pay and display car park for Aira Force (unless you are a National Trust member). If the charges are too much, I suggest pinpointing the car park location then driving back along the lakeside road towards Pooley Bridge. There are some rough lay-bys, if you do not mind the extra walk along the road. 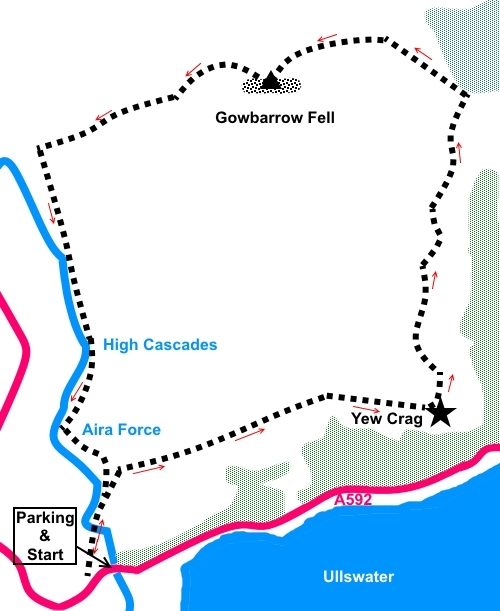 In the interests of consistency, my directions start from the Aira Force car park. There is a café and toilets. Start: With your back to the road, take the track at the rear right hand corner of the car park. When the track forks, keep to the more major track to the right. At another major fork in the track, where the area looks park-like with seating, head right to cross the stream via the footbridge. 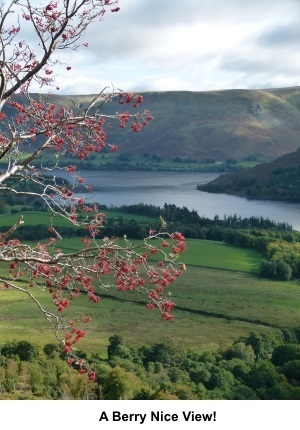 There are footpath markers for the “Ullswater Way”. After the bridge, climb some steps made with cobbles. At the top of them, take the right hand fork along by the fence. 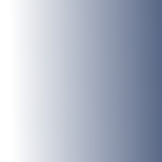 The left hand fork will be your return path. 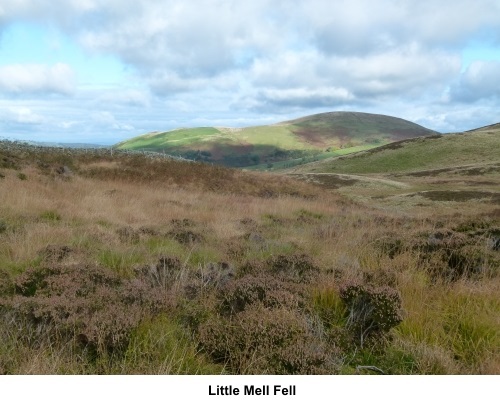 At the next fork, go right through a walkers’ gate on to the open fells. The short path leads to a more major path. Turn right. 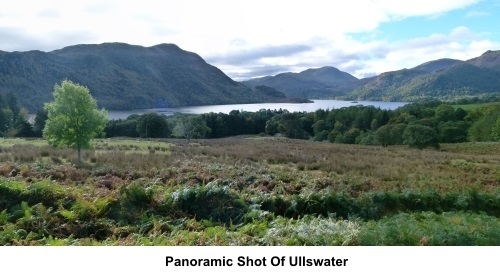 Gorgeous views of Ullswater start to open up. At NY 404204, a small path branches off to the right but stay on the main stony path gently climbing. The path now follows the contours of the hill for the next half mile or so. It is clear on the ground, so little scope for going wrong. 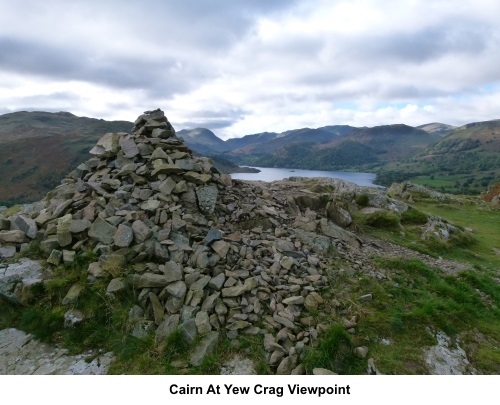 At NY 414206 is a great viewpoint marked by a cairn; Yew Crag. 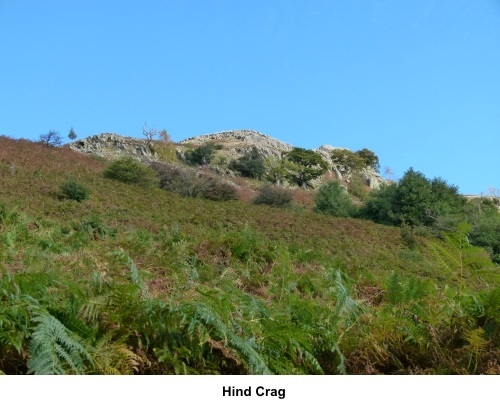 After Yew Crag, follow the path as it rounds a corner. In the distance ahead, you can see the Howgill Fells. At NY 415218, just before woods and a walkers’ gate in a wall, the path forks. Take the left fork. The path is well trodden and obvious. At NY 415218, ignore the path which branches off to the right. Stay with the most obvious path as it curves left. Do not go through any walls and you cannot go wrong. At NY 408219, a path branches briefly left to climb the final “lump” to the trig. point but you can stay on the path around it if you do not want the extra effort. Throughout this section of the walk, there are fantastic views to the north and in particular of Blencathra with its many ridges. Assuming you go via the trig. point, after it, follow the main stony path as it curves right then forks left. Otherwise, just follow the main path. The path drops quite steeply down and through a walkers’ gate to a three way fingerpost. Turn left for “Aira Force 1 mile”. In the woods, come to a three way fingerpost. 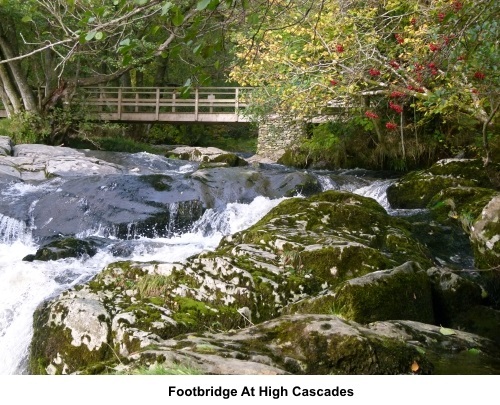 The route is straight ahead for Aira Force but it is worth a brief diversion to the right to see High Cascades. Back on the main route and still in the woods, just before a walkers’ gate, branch off right, descending towards Aira Beck. There are more interesting cascades. Turn left to follow the water. 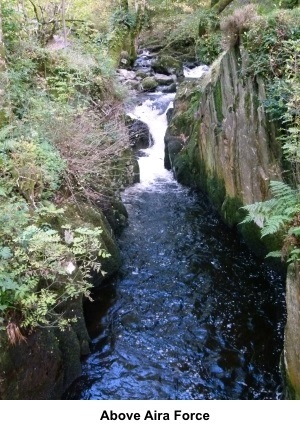 At a stone footbridge, there is an interesting view of Aira Force from the top. Continue on your original path as it descends a number of stone steps. Turn right at the bottom to another bridge from which the dramatic power of Aira Force is apparent. Return the same way, this time passing the bottom of the steps you descended. This path returns you to the bridge and “park-like” area from where you started.